We embarked on our journey at exactly 10am on a hot Tuesday morning in July to Sokhone in the Saloum Delta. On arrival we immediately spot a group of women neatly sited under a tree, a quick count would place the number to about 25. They are dressed in colourful African fabrics and are quietly passing a yellow container containing money. 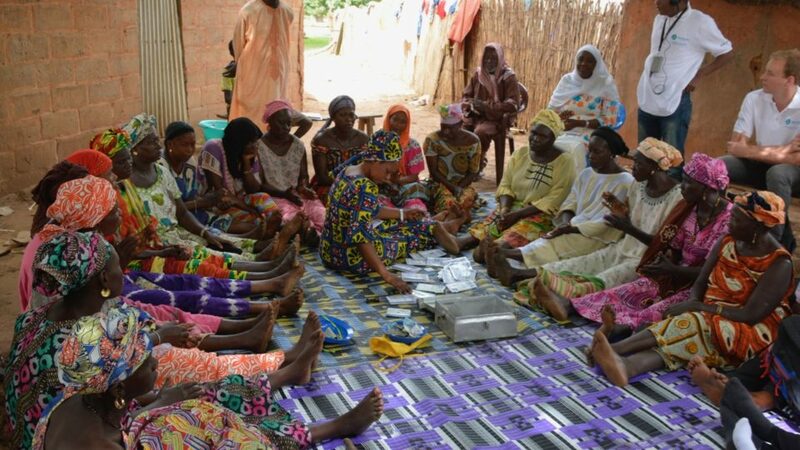 We were informed that this was the Badoudou Women Savings and Credit Group and they had gathered here for their weekly meeting. 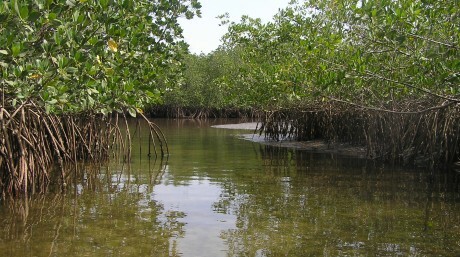 The Badoudou women savings and credit group is located within the mangrove area of the Saloum Delta and is supported by the Mangrove Capital Africa Programme. It is one of the 20 groups that have been formed and supports over 500 women in the area. 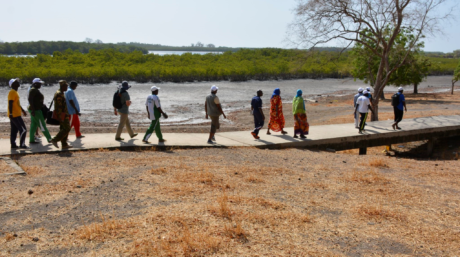 The Mangrove Capital Africa programme has supported the formation of the groups, enhanced the capacity of the women and the group agents through different trainings that have helped them be independent and wisely manage the mangroves to improve their livelihoods. Before the women would harvest mangrove products from the mangroves including oysters and sell them but the income from these products was limited and the harvesting of oysters was done in a destructive way. Now the savings and credit group provides them with an option to get more money. 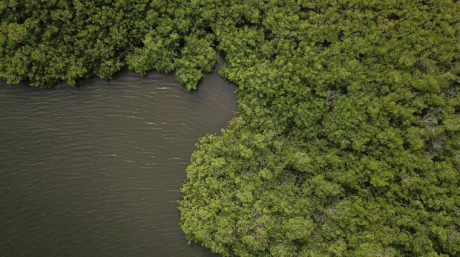 Additionally, they have been provided with an option on how the oysters can be harvested without destroying the mangroves. Following this they organise a mangrove tree planting campaign every year together with the forest department. What struck me is the orderly way in which the women sat around the mat and conducted their business. Despite the heat, the atmosphere under the tree was cool. The ladies moved over and made space for us to squeeze in the circle. As soon as we settled and the chief and coordinator had welcomed us, the women continued their meeting. The group coordinator called the meeting back to order. A cash box with 3 large padlocks was set in the middle of the circle; 3 different women then proceeded to open the locks – one by one. As each lady opened the box, wrapped her key in the fabric she was wearing then, she proceeded to move back into her spot in the circle. We learned that all 3 women lived in different houses within the village and that they are not allowed to engage with each other because of the responsibilities they share. The women then proceeded to count how much money was available in the box from the previous meeting. 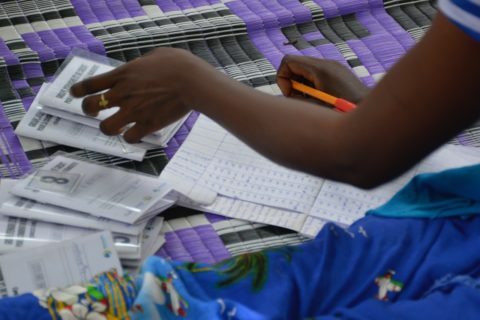 At the same time, the savings books are handed over to each of the 25 women – the savings books are each labelled with the participant’s name and a unique number to each of them and the books indicated how many shares they each have. The exercise started with receipt of contributions for their “Solidarity Fund” – this fund that is used for small projects and serves as a resilience kitty for example if they raise enough money they can use for community developments like buying cooking stoves or restoration activities. They then proceed to purchase shares at 250 CFA (which is less than a dollar) per share, funds for this go into a savings kitty; each woman can purchase a maximum of 5 shares per sitting. Despite the fact that the group was only 2 months only, their progress was impressive. They had jointly collected funds for their savings kitty and a “Solidarity Fund”. Any lady that is late or misses a meeting has to pay a fine of 100CFA. After every meeting, the women continue for 30 more minutes as they address issues affecting them and to discuss behaviour change alternatives. Under Mangrove Capital Africa programme, the plan is to further equip the women with business skills and sustainable practices to enhance their livelihoods and increase their knowledge of the ecosystem biodiversity. 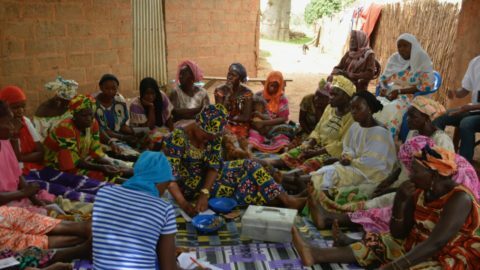 The women in Badoudou are learning day by day to jointly accumulate savings and this is what Mangrove Capital Africa is about – enabling mangrove-dependent communities to improve their capital and improve their livelihoods while conserving the mangrove ecosystem.